I focused on the 7 tone equal temperament (7-tet) scale as a means for making danceable music. This album is composed of a mode using 7-tet as a diatonic scale and 14-tet as a chromatic scale. SUNERU: Enjoyed playing with simple melodies and waveform editing. HIKARU: The Second Viennese School’s twelve-tone technique has an unexpectedly ‘popular’ sound when applied in 7-tet. HANERU: I made this track as I pleased. YOMU: I used perfectly paralleled melodies and tried to show the surprisingly amiable character of a 7-tet pentatonic scale. OUCHI: In 7-tet, we cannot possibly make any unpleasant chords. I used this feature to play polyrhythms. HAIIRO NO UMI NO SOKO DE: A vocal song in 7-tet. I realized this by using YAMAHA VOCALOID2 vocal synthesizer and by setting pitches with software called “はちゅ～ん”. ASOBU: By using two 7-tet scales inside one 14-tet scale I created a mode change. Can I be silent about love and hate? 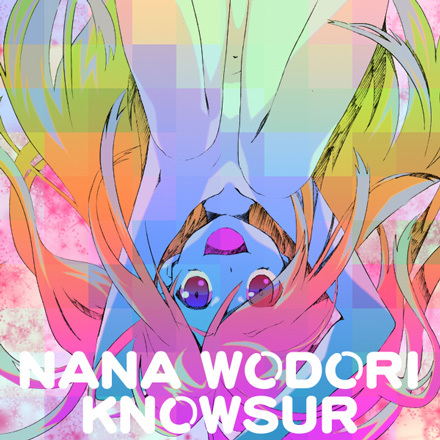 NANA WODORI is licensed under Creative Commons Attribution 3.0 Unported.